Perhaps you think I blew it writing-wise. Maybe you think I finished a manuscript, then peddled it out to a few writing friends and they all professed how much it reeked. I did, I did, I did and they certainly did (and deservedly so), but that's not what this post is about. This is a photo of the glory hole, where the pieces are heated up while they're being worked on. A couple of weeks ago I was at a glass blowing event. Third Degree Glass Factory has a fun-filled evening every third Friday. There's a live band, a food truck, fire dancers perform, there's opportunities to make jewelry or tiles, along with glass blowing demonstrations. My daughter, granddaughter and I sat for 30 minutes or so watching the demonstration. Artists were working on making vases while another artist explained what was happening. At one point he was filling us in on why they have to shape the piece, put it back in the glory hole to heat up the glass a bit, and then shape it some more... that many times they can't make dramatic changes to the shape all at once. It has to happen incrementally. If it's too thin in spots, the glass has to be handled delicately and gradually. "The glass dictates the piece," the man said at one point. That resonated with me. When I'm writing fiction, the character dictates the piece. If some dialogue sounds too adult (if I'm working on a conversation between two kids) or if it isn't logical (when it comes to the plot), I have to rework it. For me, when my writing is thin, when it lacks some depth, I know I have to make small changes--gradually--as I reshape the story. 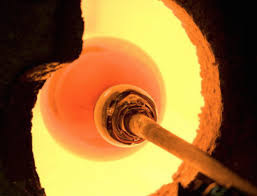 As I watched the glassblowers turning the punty (the pole the glob of glass is attached to) to shape the piece, I realized that is what I do when I revise. I turn the plot events over and over in my mind. The various word choices tumble around in my head. The story revolves in my brain, until it's unfurling in a way that makes it compelling. Recently I've been to several of these events. Years ago, when I was ignorant, I'd look at glass art and would be aghast over the high prices. Now I know. I know the blown glass art is pricey because 1) it takes a great deal of time to create and 2) it requires artistry. What kind of art fascinates/attracts you? And (bonus points for this one) how can you connect that art to your writing? Sioux Roslawski is a former needle-pointer/counted cross-stitcher/bargello-er/quilter/decoupage-er. She now dabbles only in writing, zentangle-ing and knitting. In Sioux's spare time she spends time with her granddaughter, along with rescuing dogs for Love a Golden Rescue. 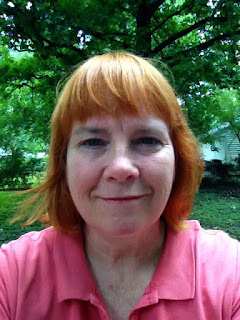 If you'd like to read more of her stuff, check out her blog. The saying, "The glass dictates the piece" reminds me of the hermit crab form, which I've been experimenting a lot with lately. "The format dictates the piece." Meaning a found format that you use to write about a topic, and the format drives the content. I love doing that because you never know what the format will bring out of you. As writers, I love that we can find writing tips in life everywhere. HAHAHAHA! Ang, I thought the same thing. Angela--You are sooo right. The format we choose can make our writing go into unexpected directions. Margo--There is the hilarious series "Drunk History." Perhaps there should be a series called "Drunk Writing." Renee--I sat watching a friend once during her glassblowing class. It was so incredibly hot, I didn't know how she was able to stand it. Sioux ~ I love Drunk History! It's seriously one of the funniest shows out there. There's a writing craft book called "Naked, Drunk, and Writing" - it's a good one. Yep, glass blowing is mesmerizing to watch! And a perfect analogy for writing. And Drunk History is hilarious. Cathy--I just ordered a copy from Abebooks. com. I think with shipping it was $7-something. I agree with the comments about glory hole, because that's the first phrase that jumped out at me when I first saw this, so had to read it! Second, this is a great analogy for writing, thanks for sharing, Sioux!